WE HAVE GREAT INCENTIVES FOR YOU! By participating with a minimum of 25 acceptable items you earn 70% of your total sales and you get to shop a day before the public! No children under 10 are permitted after 5:00pm during the private sale. Be sure to pick-up your wristband at drop-off. We know that YOU are our best form of advertising! So telling everyone you know about the upcoming sale, will help you sell more of your GREAT kids stuff! Also, referring consignors will put CASH in YOUR pocket! 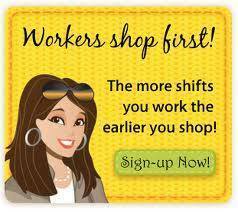 For every consignor you refer, YOU will get $5.00 off of your registration fee! Interested in earning 80% of your total sales, shopping BEFORE 5:00, or getting Duck Bucks to spend at the sale? We offer even better incentives to all our volunteer workers!